Evan Fournier competed today after working out in a one-on-zero setting for the scouts in attendance yesterday, and helped himself considerably more in turn. In 29 minutes of action, Fournier scored 12 points, looking smooth creating his own shot on the perimeter and making plays being aggressive in transition while showing good court vision finding the open man. The top 2012 draft prospect at this event, Fournier shot well today, going 2-4 from three in the first game and 2-3 in the second game, which was extremely important considering that this is the area he struggled in most this season. Had he shot a better percentage from beyond the arc with Poiters this season, its reasonable to wonder if he would be considered a legit top-20 prospect in this deep draft. He will leave tomorrow for the United State for workouts with Indiana, Memphis, and Dallas. 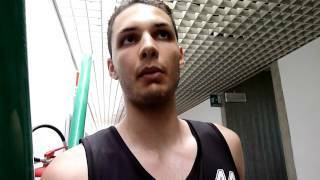 We caught up with Fournier, who emphasized his desire to play in the NBA this coming season, after he led the French U20 team to a victory over Russia's U20 squad. French swingman Evan Fournier came into the 2011 Nike Hoop Summit with some recognition after stringing together some very intriguing performances for Poiters in Pro A France over the past few months. He stood out immediately in the practice sessions with his excellent size, mature frame, high skill level and terrific scoring instincts on the wing. He plays at a very nice pace and has a smoothness and craftiness to his game that enables him to get into the paint off the dribble, utilizing his deceptive athleticism and very aggressive mentality. He uses jab-steps nicely and has strong footwork and ball-handling skills, showing especially nice timing on his drives, where he can use spin moves and finish elegently. He also displayed a very good feel for the game, often throwing nice passes to set up his teammates off his penetration. In France he's at times the one who's asked to bring the ball up the floor for his team, demonstrating his intriguing versatility. He showed the ability to finish in transition and in the paint against the other World Team members, but he struggled in the game, shooting 2-8 from the floor, and looking somewhat nervous and clearly being bothered by the length of Team USA at the rim. In the practices and from the game-film we watched it seems like he does an excellent job of using his strong body around the rim to shield opponents and finish through contact, though, so it's possible he may have just been pressing in the actual game. A big key will be his growth as a jump-shooter, as he's only shooting 19% (7-36) from behind the 3-point line this season for Poiters. From what we observed in practice, this looks to be correctable as he has nice form in his upper body and release, but has some trouble with his lower body and footwork, with his momentum carrying him too far forward. Defensively, Fournier has good size at 6-7, but average length (6-7 ½ wingspan). He played hard all week in the practices and scrimmages, showing solid toughness, but may lack a degree of lateral quickness to guard some of the more explosive players he'll eventually match up with in the NBA. Ultimately, his performance on Saturday night was a bit of a disappointment after such solid showings in practice, but Fournier shows great promise and clearly has NBA potential down the line if he improves his perimeter shot and continues to produce at a high rate in Europe.